Last June, we heard reports that the Corsair name would not, in fact, be used as part of an Edsel rebirth, but for the Lincoln MKC crossover replacement instead. But as far as Lincoln crossovers and SUVs have been going, the car might actually turn out to look pretty good. 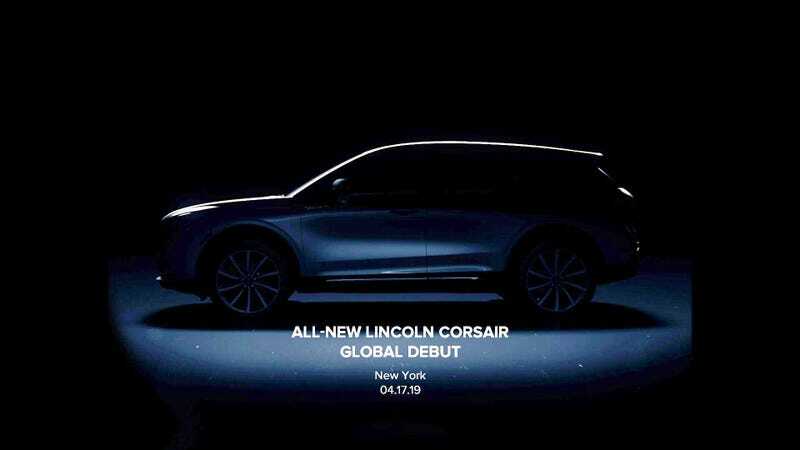 All Lincoln offered today, ahead of the 2020 Corsair’s official debut at the New York International Auto Show next month, is a shadowy teaser of its new crossover, on which I have taken the liberty to brighten up as much as possible so you can see it. Lincoln notes that the pre-production model is pictured here. Official details haven’t yet surfaced, but I’m glad that the old MKC name is being put to rest. The Corsair will join the new range of Lincolns with the good and memorable names like Aviator and Nautilus. The new Corsair, Car and Driver believes, will also apparently will have the same underpinnings as the Ford Escape and probably offer a hybrid version. The debut of another crossover isn’t enough to give me pause, but I do very much like Lincoln’s current design language. It’s done away with the horrible “waterfall” grille and instead replaced everything with smooth and sleek lines that definitely look like they will age better than the previous batch.